When your tinder catches the fuel, your campfire will burst to life! Add more fuel to build bigger, hotter, longer-lasting campfires. To begin building a campfire, you must place a campfire ring on the ground. Open the Magic menu, select Powers, and select “Survival Skill: Build Campfire”. Press the Shout key to begin placing the campfire ring. When you have selected where you would like it to go, press the confirm button to place the campfire ring. Click on the campfire ring and select “Use” to bring up the campfire crafting menu. To build a campfire, you need fuel. The starting fuels for a campfire are branches, kindling, or ruined books. Add 2 of any of these fuels to your campfire to go to the next step. Several different items can be used as tinder. Your choice of tinder is important as it determines how long it will take to successfully light the campfire. It is much harder to light a campfire in bad weather, so being prepared by carrying high-quality tinder for when the weather turns sour is always a good idea. 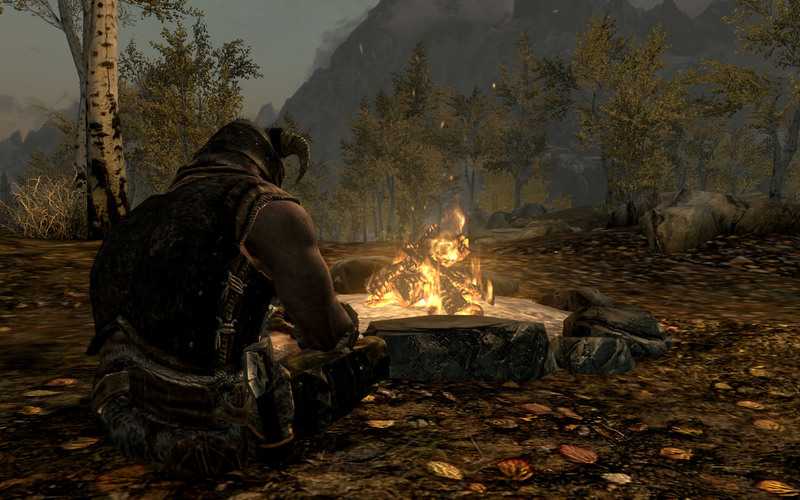 The time to light a campfire in all weather conditions can be improved with the Firecraft Camping perk if using Strike Stone, or the Destruction skill if using magic. Be careful: a starting campfire only lasts for 1 hour! Be sure to add more fuel and build a larger campfire quickly, or else your tinder and fuel will be lost and you will have to start over. A good strategy is to already have enough fuel for at least a flickering campfire ready before you begin building a campfire. That way you won’t run the risk of your campfire burning out before you can find more fuel. If your tinder fails to catch the fuel, the tinder is lost, but the fuel will remain so you can try again. Add more tinder until your fire is successfully lit. To light your fire, select either Light Fire (Strike Stone) or Light Fire (Magic). If you select Strike Stone, your Firecraft Camping perk reduces how long it takes to light your campfire (7 seconds per rank). When you light the fire, you will gain Camping skill experience. If you select Magic, your Destruction skill reduces how long it takes to light your campfire (7 seconds for every 20 points). When you light the fire, you will gain Destruction skill experience. From here, you can select further recipes, which create increasingly larger campfires that each grant unique benefits. These benefits are cumulative; for example, a crackling campfire has all of the benefits of a starting and flickering campfire as well. Refer to the table below. "Uplifted" - All skills improve 3% faster for 6 hours. "Inspired" - All skills improve 5% faster for 6 hours. You and your followers can sit near campfires by clicking on the campfire ring and selecting Sit. If you sit near a campfire, up to 3 of your followers will, too. Be resourceful and keep an eye out as you explore your environment for items that can be turned into tinder. Use Survival Skill: Instincts to help you in your search. Campfires you create will remain in the world for 24 hours after they have burned out, after which they will disappear and be removed from the game. Created campfires can be put out using a frost spell or shout. They will remain in the world for 24 hours unlit, after which they will disappear and be removed from the game. Campfires that have been put out must be re-lit using tinder. If there was any unspent fuel before the campfire was put out, it will be given to you when you click on the campfire again. Campfires cannot catch placed camping equipment on fire. If you use SkyUI, you can bind the Survival Skill: Build Campfire ability to a hotkey. This will remove the power from your spell menu. Defaulting the hotkey in the Mod Configuration Menu will give you the ability in your spell menu once more.